A new report holds that Apple is looking for fresh design input for its celebrated line of retail outlets, and that the iPhone maker has turned to the company responsible for its forthcoming "spaceship" campus. Apple is said to have tapped Foster + Partners for a fresh take on its Apple Stores, according to a new report on Wednesday from Marketing. Sources close to the project reportedly said the two companies are collaborating on future Apple Store designs. Foster + Partners is behind the design of Apple's new Campus 2 design for its upcoming corporate headquarters. 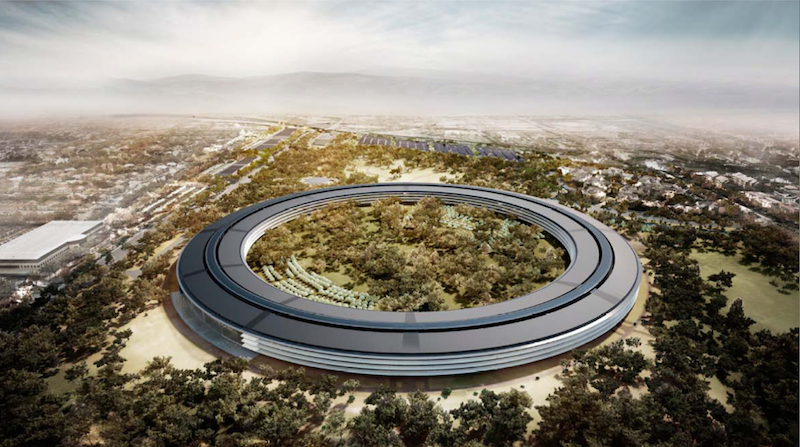 The two companies have worked together before, with Apple tapping Foster + Partners for the design of its "spaceship" campus, which Apple is expected to move into in 2016. That project, initially priced at $3 billion, has reportedly ballooned to $5 billion, though cost-cutting efforts are thought to be underway. Foster + Partners' previous work includes the McLaren Technology Centre and New York's Hearst Tower. Apple in the past has worked with Bohlin Cywinski Jackson, Foster + Partners' rival, on its Apple Store designs. BCJ is the firm behind Apple's iconic Fifth Avenue store in New York, and the Regent Street location in London. Apple secured a trademark on the distinctive design of its retail outlets earlier this year. Apple's stores have gone from novelty retail outlets to something approaching a community center, according to Apple CEO Tim Cook. The retail locations saw 120 million visitors in the fourth quarter of last year, with some locations so heavily-trafficked that Apple is closing them to move them into larger spots.